Happy Birthday Artist Aubrey Beardsley! English Artist and illustrator Aubrey Beardsley was born today in 1872. 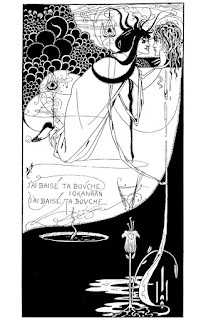 Beardsley was best known for his dark and grotesque Art Nouveau illustrations. He once said, “I have one aim—the grotesque. If I am not grotesque I am nothing.” Beardsley suffered from tuberculosis until his death on March 16, 1898 at the age of 25.